Unleash the power of you iPhone’s camera! Pictar is a powerful iPhone camera-grip that connects easily to most iPhone and iPhone plus models and gives users unprecedented control over the iPhone’s camera through a user friendly app. Pictar is controlled by no fewer than five external buttons, and includes a patented, revolutionary interface which uses sound frequencies to activate the camera, which saves battery power compared to the standard Bluetooth connection. 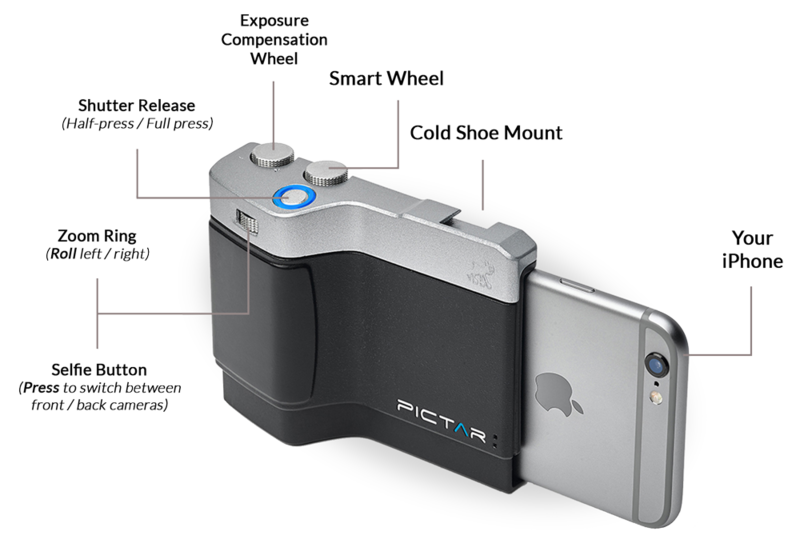 Pictar was born to address mobile photographers of all levels from social recorders to professionals who wish to get more from their iPhone camera and miss that good-old feeling of firmly holding and easily controlling a traditional camera. Including padded pouch, wrist and neck strap. Pictar app offers easy control of the iPhone’s camera, with unique features such as manual focus, shutter priority, ISO priority and more. It is wirelessly operated via ultrasonic system for significant power saving compared to existing Bluetooth systems.